• How quickly is content fund $50m available after ABC share hits 8.7%? 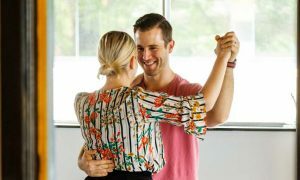 Nine has won its second night of week 10 with Married At First Sight again helping power the primary channel to top spot. It was a close call however with just 0.1 of a point separating Nine and Seven. Seven was able to claim a combined channel share win though, but it was just 0.2 of a point ahead of Nine. The ABC’s new head of television will be wanting to start spending some of that new $50m for Tuesday content after the channel’s share slipped to 8.7% last night. A quick flick through the record books indicate it would be one of the lowest Tuesday channel shares ever. Tops off and pants down on different shows last night at Seven. Tops off in Home and Away in one steamy scene with the Tuesday numbers on 670,000. It was then pants down in one scene on 800 Words later in the night with 594,000 watching. The ratings were also down, from 639,000 last week and 718,000 the week before that. Filling the gap between the sauciness was another Kitchen HQ episode of My Kitchen Rules, which brought all 15 remaining teams together. The Tuesday audience of 1.05m made it second in the slot. While the other reality shows are moving toward and end, there is still a long, long way to go for MKR. Leila McKinnon was hosting A Current Affair last night with 803,000 watching as the show gave some battlers the chance to sample some of the perks enjoyed by politicians. Married At First Sight featured a monster dinner party and Cheryl and Andrew were greeted like rockstars when they entered the room. The Tuesday audience was 1.12m after 1.08m last week. The show is making a habit now of ranking #1 and cleaning up in the key demos too. Travel Guides went to Oman with the Aussie tourists spending time by the pool, visiting a mosque and sand dune sledding. The audience of 615,000 was up on last week’s 554,000. The Project did 554,000 after 7pm and featured great work from Maude Garrett in Los Angeles where she managed to get Tom Hiddleston to give an acting masterclass during her few short minutes with him on the Kong press tour. I’m A Celebrity…Get Me Out Here! has just six contestants remaining after five have been evicted from the jungle in the past four episodes. 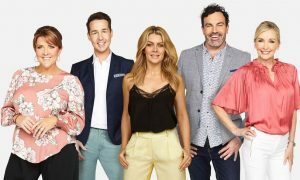 The show’s Tuesday episode did 662,000 to start with and then the numbers lifted to 746,000 as former MKR contestant Ash Pollard was sent home. NCIS did 441,000 and NCIS: Los Angeles was on 307,000. Many of the Tuesday regulars failed to show up last night as share was close to an all-time low. The audience movement started with 7.30 which was on 455,000. The first part of the locally made Brian Cox: Life Of A Universe did 366,000 at 8pm. The first of the two-part The Indian Dream Hotel On Tour after 8.30pm then had 303,000 watching for tips about retiring to Florida. The premiere of Project Lazarus then did 149,000 after 9.30pm. Michael Portillo was travelling across Switzerland in Great Continental Rail Journeys. The show was the channel’s most watched last week on 309,000 and it could be again #1 for SBS in week 10 too with an improved 332,000 last night.